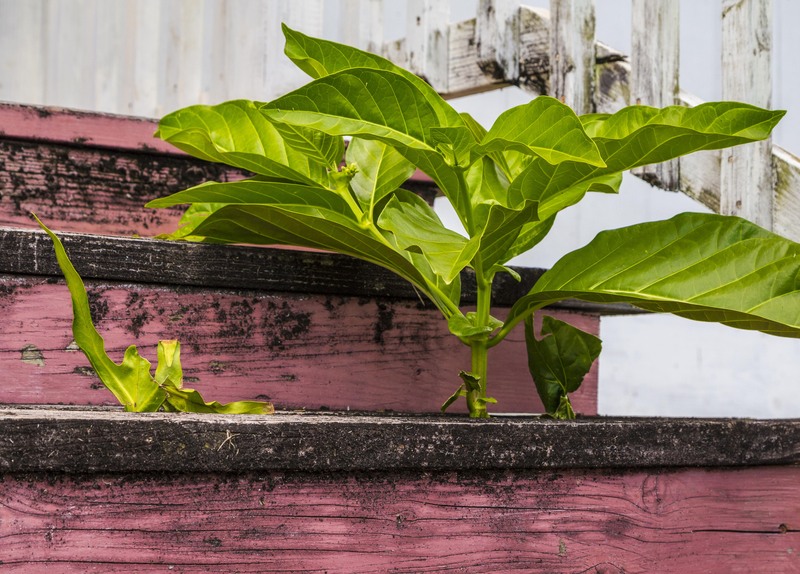 Tropical plants have a will of their own. They have to grow into the sunlight or die, even if they begin life beneath the rain forest canopy…or a flight of wooden stairs! This plant actually forced its way between the tread and the riser on this set of wooden steps that lead to a gathering hall behind a church. You can see that some additional leaves are also beginning to poke their way through. Now that’s what I call determination. What is the upside of a long and heavy downpour? Photographically, I can think of at least two: waterfalls and rainbows. 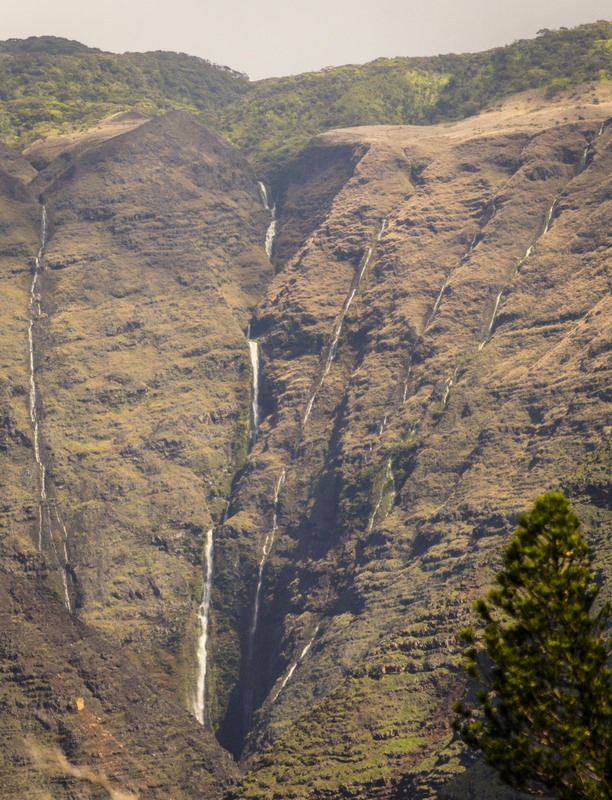 After a heavy rain, dozens of waterfalls were streaming down the steep volcanic cliffs of Moloka’i. As the clearing storm clouds cast continually changing shadow patterns on the mountainside, I marveled at the sight. Within a day or two, most of these waterfalls would disappear. But for a while, each crevice of basalt was highlighted with a bright white ribbon of water following the path of least resistance. 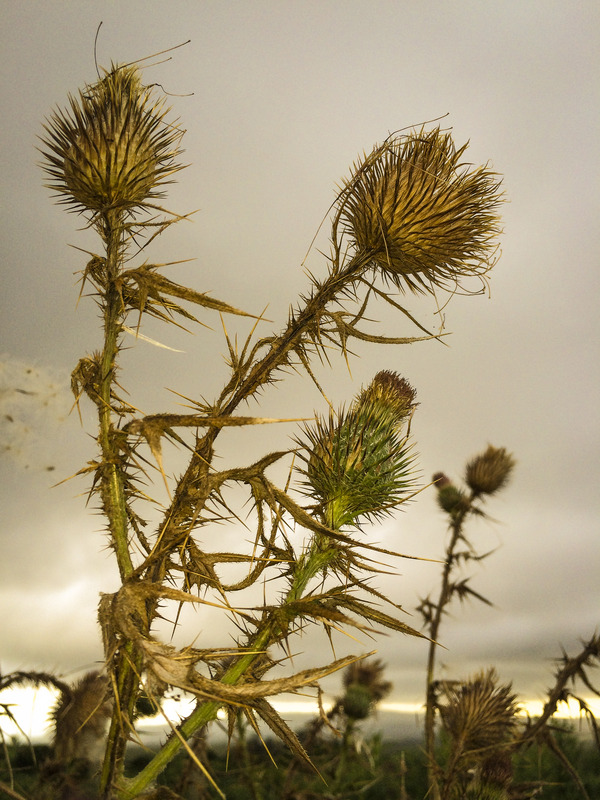 Thistles are one of many invasive plants in the Hawaiian Islands. 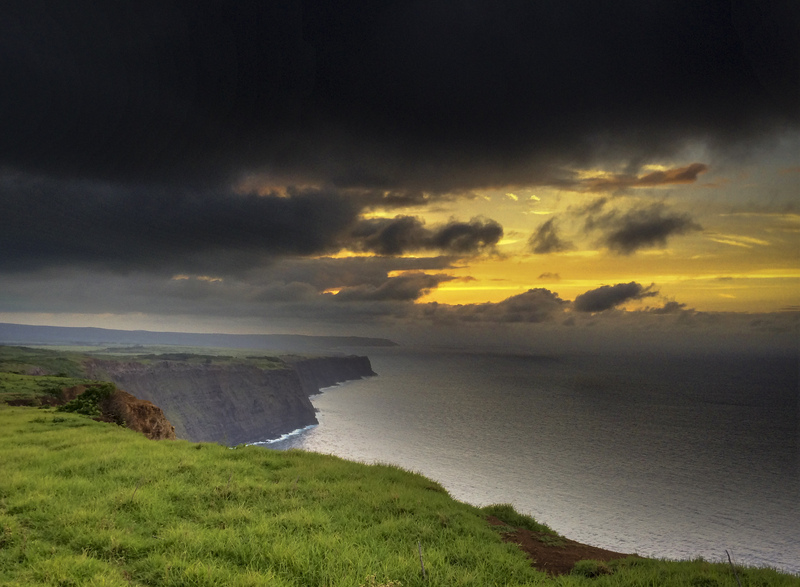 This image was taken on Moloka’i, where the plant has aggressively taken over former grazing land. This plant is sharp from ground to tip, and will easily pierce clothing and skin. The seeds are carried readily on the wind, and in an area that sits in the trade winds (as the Hawaiian Islands do) this is a real problem. Sadly, this is just one of many plant and animal species that is causing problems in the islands. 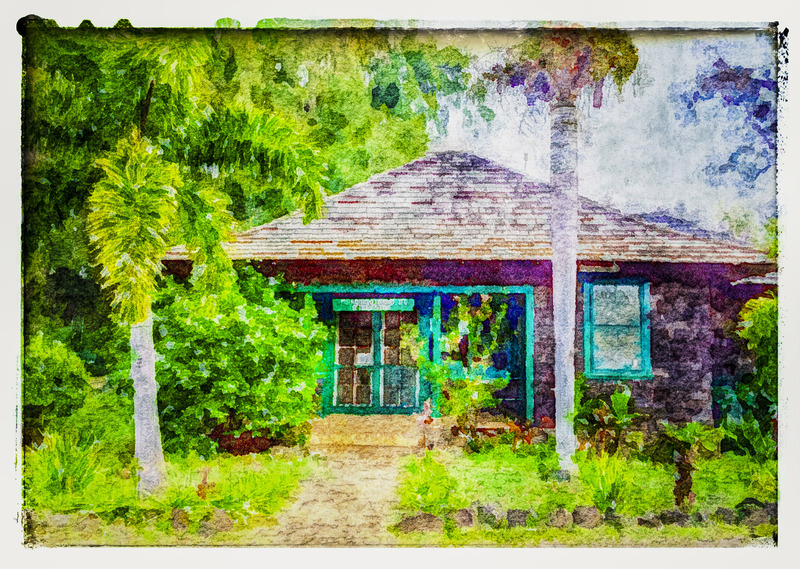 This is the Pu’u o Hoku Ranch store. Located on the east end of Moloka’i, it’s the last place you can pick up snacks and drinks before heading on to Halawa Valley. Pu’u o Hoku means “Hill of Stars,” and indeed the stargazing is nothing short of phenomenal if you find yourself on this side of the island on a moonless night. An old cemetery behind a long-gone church is being taken over by trees and vines. Few tourists even notice it, and most of those that do are discouraged from exploring it further by clouds of ravenous mosquitos, and huge spider webs–most housing huge but harmless spiders–that seem to have been deliberately constructed across anything remotely resembling a footpath. How said mosquitos manage to avoid said spider webs is a scientific mystery. This intrepid photographer managed a few smart phone shots…there’s no way to set a tripod up here! 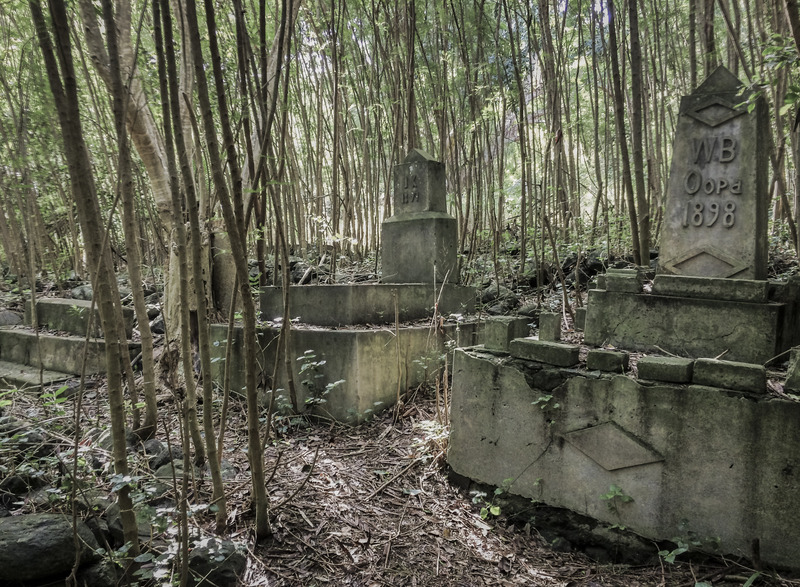 I love the contrast between the few, massive cement grave markers and the hundreds of slender, delicate tree trunks surrounding them. I’d love to come back in 50 years to see how the cemetery has changed. Will it be a forest, or will it be restored? It only took a five minute shower to produce this pretty rainbow. 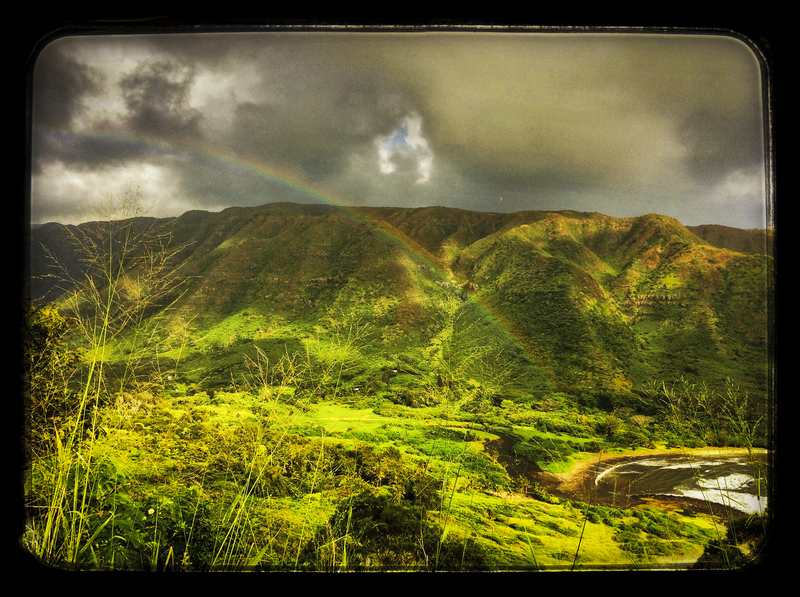 And the wonderful thing about Hawai’i is that it doesn’t just rain in April…you can expect rainbows any time of the year. …there was a sugar mill in this building. 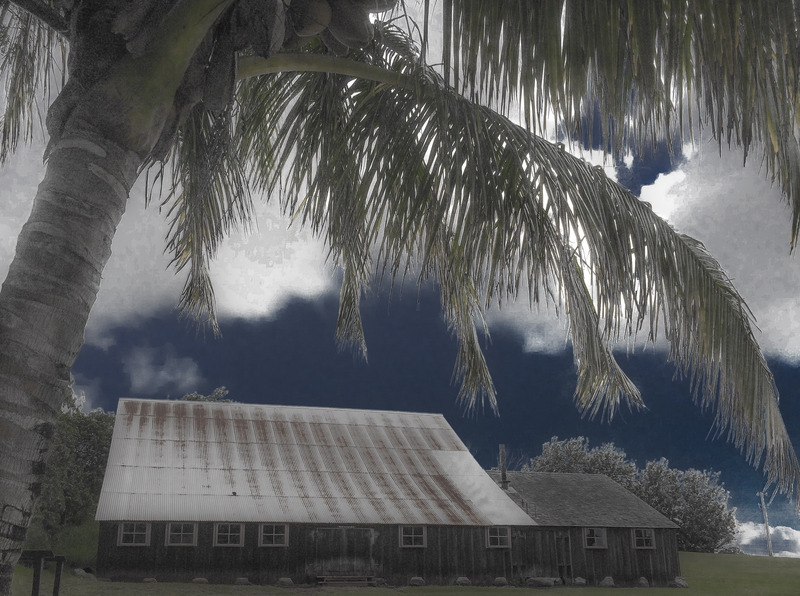 The R. W. Meyer Sugar Mill operated on Moloka’i from 1876-1889. It is now a museum and still has some of the old processing equipment in the building. Geckos are frequent visitors to Hawaiian homes, especially in the moister parts of the islands. I love watching them climb up the walls and even across the ceilings. This tiny one was climbing across the window screen of the cabin I was sleeping in one evening. You wouldn’t think there would be enough surface area on a wire mesh screen for the gecko’s little sticky toes to grab onto, but as you can see, you would be mistaken. This gecko had no trouble at all meandering across the screen. This critter is holding what I call a classic gecko pose: legs extended, toes splayed out, and tail artfully curled. Even in a silhouette shot, its bulbous toes indicate that it’s a gecko and not another type of lizard. Plus the screen lends not only some texture, but also scale: you can guesstimate that this gecko is about three inches long. 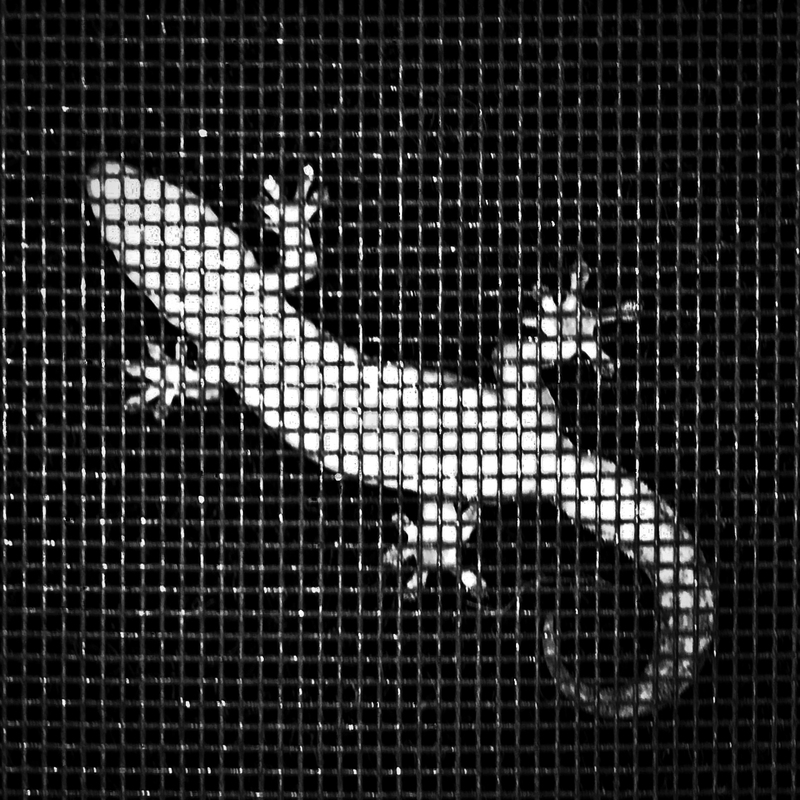 And no, geckos don’t glow in the dark…the light from inside the cabin illuminated the gecko’s light belly and made it appear extra bright against the dark night outside the window. You may recognize the title of today’s post as the opening line of the poem “Mending Wall” by one of my favorite poets, Robert Frost. Although Frost talked about a wall along a property line in New England that was damaged by ground frost and hunters, there are certainly other forces at work on this old church wall in the Halawa Valley. After the church burned, the humidity and the foliage have been disintegrating the remaining cement and stone walls slowly but steadily. I love how you can see the way the round lava rocks were used to construct the walls. 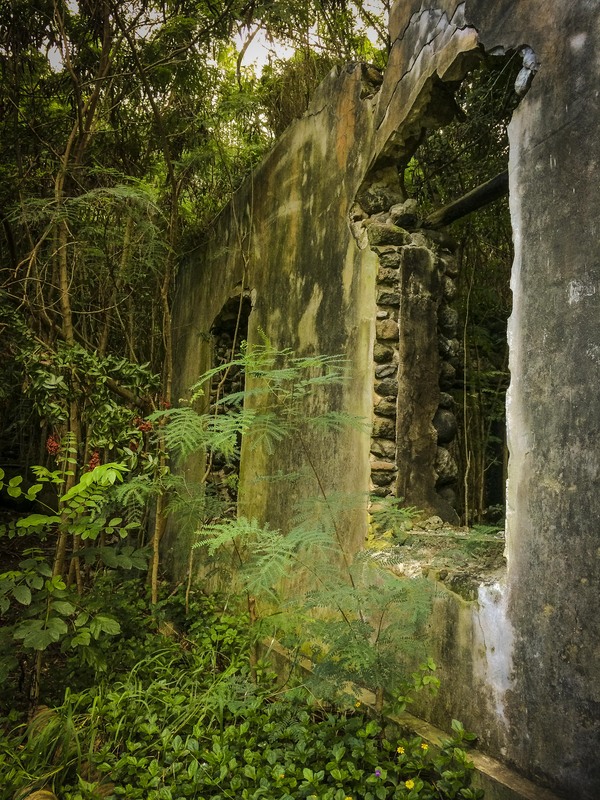 In a few more years, hard to say how many, there will be nothing left of this building except piles of lava rock scattered on the floor of the jungle.